The Fellowship was fortunate enough to obtain a copy of KING: MANDRAKE THE MAGICIAN #1 from Dynamite Entertainment. The story is written by Roger Langridge, illustrated and colored by Jeremy Treece, and lettered by Marshall Dillon. After several years, Mandrake comes out of retirement to perform at a charity gala for the Emergency Relief Fund. During the performance, fellow magician Karma volunteers to assist him. During the show, a couple breaks into Mandrake’s “Occult Chamber” looking for a particular item. What danger (and painful memory to Mandrake) is the duo about to unleash? Is Mandrake (while youthful looking is very old) up to the battling the nightmare he was afraid to come true? I really love the vibe of this issue. Roger Langridge crafts a great script with action, drama, and some very witty banter that makes this book very enjoyable. Jeremy Treece’s style gives the issue an unusual, but visually striking look. Dynamite’s KING mini-series get better and better with each issue. Definitely worth picking up! 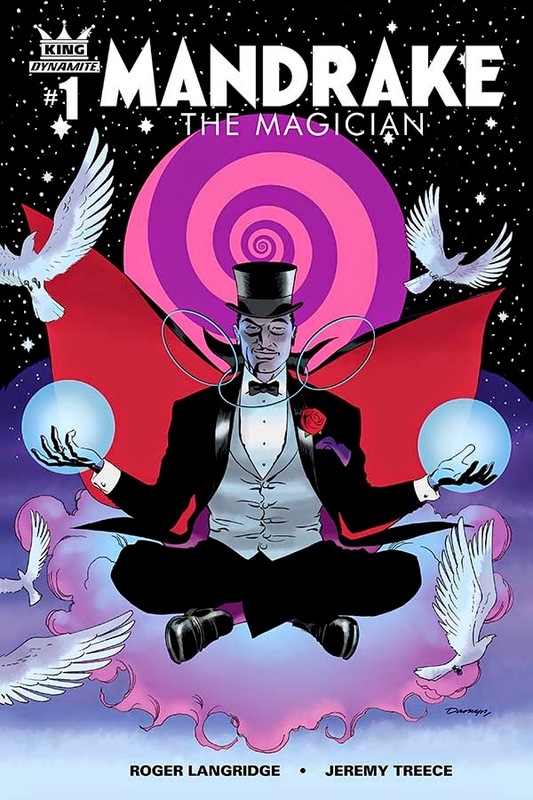 KING: MANDRAKE THE MAGICIAN #1 is in stores now, or available for ordering at www.dynamite.com.